When you take your GMAT test it will be 'computer adaptive'. This means that the testing software adapts to your performance as you progress through the exam. Understanding how the CAT works and knowing a few strategies specific to this particular format can have a direct, positive impact on your score. When you begin the GMAT, the computer assumes you have an average score (~500) and gives you a question of medium difficulty. As you get answers correct, the computer serves up more difficult questions and increases its estimate of your ability. And vice versa, as you answer incorrectly, the computer serves up easier questions and decreases its estimate of your ability. 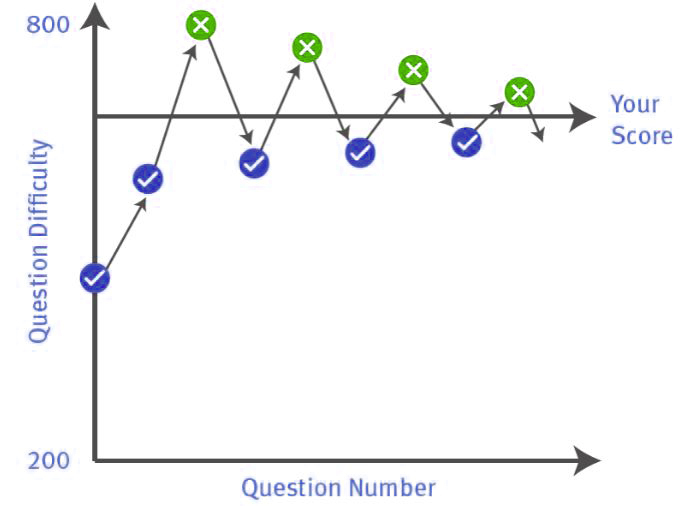 Your score is determined by an algorithm that calculates your ability level based not just on what you got right or wrong; but also on the difficulty level of the questions you answered. Because each answer directly affects the next question, the CAT does not allow you to go back to questions you've already answered. On the GMAT CAT, you see only one question at a time. You won't see the next question until you've provided an answer to the one in front of you. Once you've confirmed your answer, that's it. Since you can't revisit previous questions, if you don't know an answer, guess. Guess intelligently and strategically—i.e., eliminate any answer choices that you know to be wrong and then guess from those remaining. There is a penalty for each question you don’t answer, so if you only have a minute or two left, and several questions remaining, you should guess at random rather than leave them unanswered.